Foodbanks are fast becoming an ever more normalised and visible part of austerity Britain. The phrase ‘foodbank’ has silently slipped into our everyday speech. Most supermarkets have donation points for collecting pet food for rescue cats and dogs. Now, right next to these collections for abandoned animals are donation points with stickers plastered on them imploring people to ‘Please donate food’. The Co-op has advertised its value range of tinned products as ‘ideal items for the foodbank’, and Asda has placed Trussell Trust emblazoned signs on their shelves underneath tins of Spam saying ‘This is a foodbank item’. There were no UK-focused newspaper articles about foodbank use before 2008 and few until 2012 when the number increased dramatically. In 2004 the Trust ran only two foodbanks. Today, there are over 400, but overall they run 1500 foodbank centres. In the last financial year, over 1.1 million three-day emergency food supplies were given out to people in crisis by Trussell Trust foodbanks, including 415,866 children. And this isn’t taking into account the many independent foodbanks that help thousands upon thousands of people every day, with possibly less than half of all food banks being organised by the Trussell Trust. My research, as well as that of other academics, charities and frontline professionals showed that a major reason for people using foodbanks was the impact of welfare reform. It was common for people to have experienced significant problems with benefit delays and sanctions, which led to lengthy periods without income for themselves and their families. Other reasons that brought people through the food bank doors were ill health, bereavement, relationship breakdown, substantial caring responsibilities, precarious jobs, and redundancy. Despite the very obvious connection between the cuts to social security and foodbank use, government ministers have consistently refused to admit to a link between the two, instead choosing to dismiss foodbank use as a lifestyle choice of those who are unable to budget properly or those who would rather spend their money on 20 fags, a flat screen TV and three litres of strong cider. Addiction is seen as a ‘lifestyle choice’ – but only if you are the ‘undeserving’ poor. The second series of the TV show ‘Benefits Street’ was set on Kingston Road on the Tilery estate in Stockton on Tees, just one mile away from the foodbank I volunteered in. Aired in May 2015, just after the General Election, the opening episode of the second series of pulled in almost 3 million viewers. ‘Tourists’ flocked to the Tilery estate, driving hundreds of miles for a glimpse at the road, and the ‘Kingston Road’ street sign was reportedly sold on eBay for £65,000. The show placed a magnified emphasis on frequent criminal activity, unemployment, and a lack of education. What it didn’t tell you is that the life expectancy of men living in the poorest parts of Stockton, like the Tilery estate, has barely improved since the 1930s. A man living in the most deprived ward will live, on average, 17.3 years less than a man living just a few miles down the road in the least deprived ward. This difference is comparable to the difference in average male life expectancy between the UK and Russia or Senegal. Despite the rhetoric around poverty and benefits being a lifestyle choice, support for foodbanks has been overwhelming. 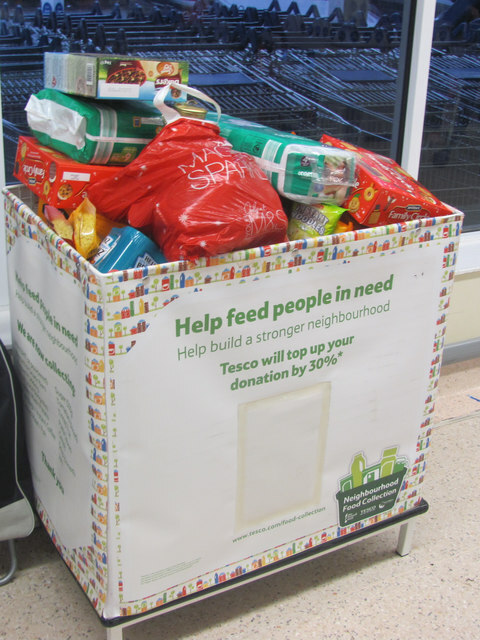 Last year, some 40,000 people volunteered with Trussell Trust, and 10,573 tonnes of food were donated. Smiling volunteers, myself included, man the so called ‘neighbourhood donations’ twice a year in Tesco supermarket, encouraging people to pick up and extra tin of soup, or packet of pasta, on their weekly shop. Many people are happy to offer charitable assistance to foodbanks but this should not be to the exclusion of asking why, in one of the richest countries in the world, more than one million emergency food parcels were handed out last year. But we need to remember that behind every tin of food donated is a person with a reason for being there, and we need to listen to them. 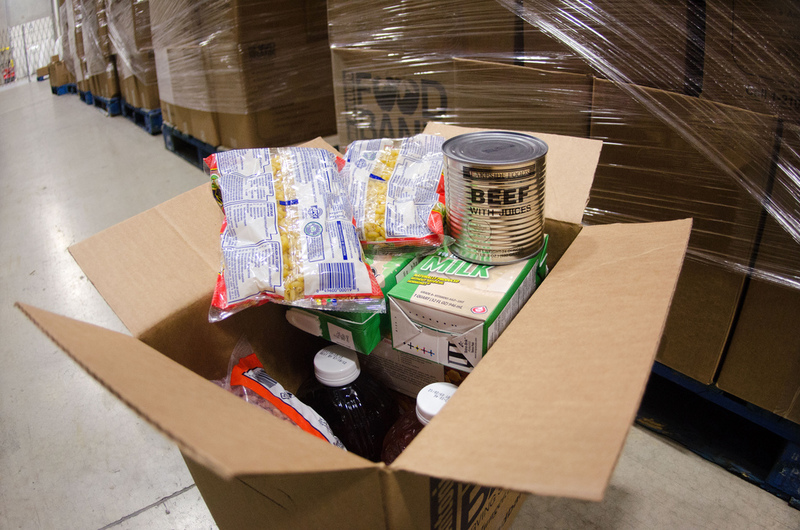 “Kindly food bank operators rarely have the resources to visit recipients at home. One imagines they would get as incensed as I do at the well-fed dogs, the obligatory wide-screen TVs, the satellite dishes, the manicures and mobiles”. Well, as a ‘kindly’ foodbank volunteer I have visited people in their homes. Are there people who used the foodbank who had big TVs, tattoos, smoked and had cars? Yeah, of course there were. Sometimes these were signs left over from a previous life when their wages paid for their car, or their 24 month contract on an iPhone 6 each month. More often than not, I saw empty spaces where a TV once stood. The only manicured nails I saw were my own. I saw well fed dogs, but they didn’t incense me. What incensed me was hearing how people were getting by, day by day, trying to stave off their hunger pains by drinking endless cups of Value range coffee. Skipping meals so their children were able to eat, even if it meant rapid weight loss and anaemia for the mother. 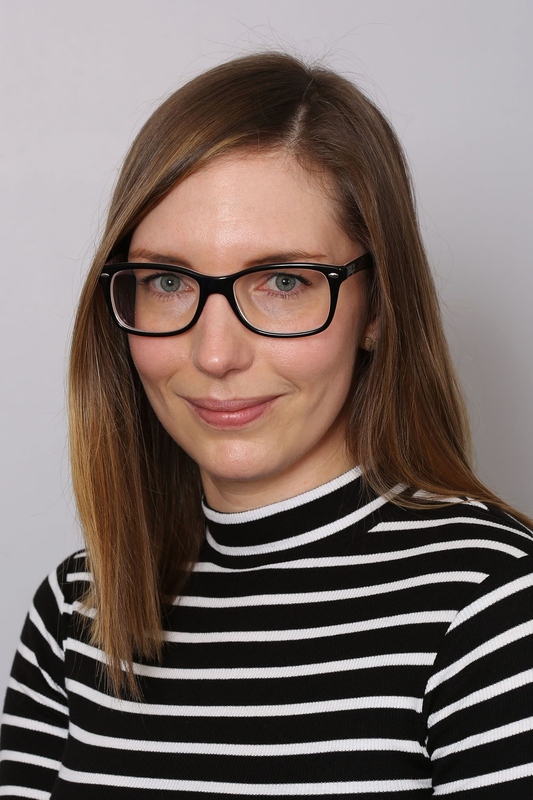 My research shows how it was common for people to have experienced significant problems with benefit sanctions and delays, which led to lengthy periods without income for themselves and their families. There is no doubt that the reasons people need to use them in the first place are messy, complicated and multiple. Ill health, bereavement, relationship breakdown, substantial caring responsibilities, precarious jobs, and redundancy were significant factors. I met Janice, 46, who was receiving Jobseekers Allowance after being found fit for work, despite recently being diagnosed with depression, anxiety and arthritis. She was waiting for her Employment and Support Allowance appeal, and came to the foodbank because she’d been sanctioned. Janice explained how she was currently doing a Health and Social Care course at college. She had been sanctioned for missing her Jobcentre appointment because she was at college, on a course the Jobcentre had actually sent her on. Her 11-year-old granddaughter wanted to know why she hadn’t been able to stay over for the last three weeks. Janice told me: ‘I haven’t got enough food to feed myself, let alone feed her as well – how can you explain that to an 11-year-old?’ Janice hadn’t told her daughters how bad things had got as she didn’t want them to worry. She had debts, including priority debts such as Council Tax, which meant the bailiffs were always ringing up, or coming round banging on her front door. As we sat finishing off our cups of tea, her phone rang. She looked at the number flashing up on the screen and sighed “See? I told you they always ring me up,” cancelling the call, as it was the bailiffs ringing her, yet again. Yes, foodbank use is complex, but that doesn’t mean the government should dismiss evidence linking sanctions and their use. Denial only sends further people heading towards foodbank doors, and does nothing to address the serious structural problems of poverty and inequality that are becoming increasingly embedded within the social security system. The long-term goal should be shutting foodbanks down because they are not required anymore, not creating bigger and better versions of them. Foodbanks should not be allowed to be a permanent part of our society. Foodbanks cannot simply let the state withdraw from its responsibilities. They must be seen as shocking and outrageous if we are to ever get rid of them. The big challenge is ensuring that emergency food support continues to be seen by the public as a consequence of food poverty and inequality, rather than a permanent solution. We need to listen to the stories and the voices of people foodbanks so that we can understand who uses them, why, and what it feels like. Perhaps these messages are reaching a wider audience now with Ken Loach’s latest award winning film I, Daniel Blake, which has been called ‘a rallying cry for social justice’ with its depiction of the inefficient and often cruel bureaucracy of the benefits system. It is hard to not feel empathy when watching the lead character Katie in the haunting foodbank scene, or in witnessing Daniel’s day to day struggles in applying for job after job, despite being unfit for work. But it is hugely important to make sure that the messages in the film, as well as the messages we’re talking about on this panel tonight, are heard not just by people who are sympathetic to what we have to say, but also by people who don’t quite believe that the benefits system is really that bad, or who are adamant that poverty is a lifestyle choice. How we harness and express the collective shame that should be felt over the existence of emergency food aid, but also on a wider level the threats to social justice posed by the language and stereotyping of people living in poverty, will be key to the future of social justice in the UK. 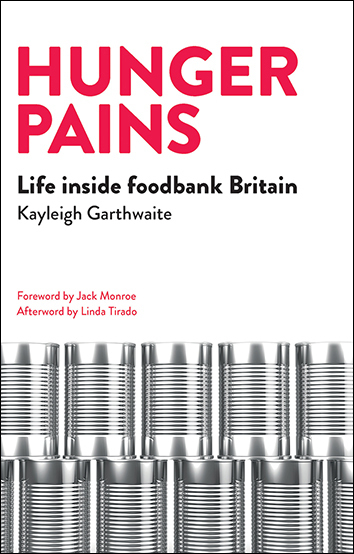 Hunger pains by Kayleigh Garthwaite can be ordered here for £11.99. An excellent riposte to austeruty obsessed Tory social policy. We need a powerful new conversation that initiates a paradigm shift, today more than ever. I understand that what you are referring to is largely voluntary charity, and with that I have no qualm, but don’t you think it’s a bit of a slippery slope to assume that every person showing up to the food bank has a legitimate reason for being there? Yes, the most pressing reason is obvious; they’re hungry and in need of food, but why? What is it about their lifestyle that does not permit such basic necessities as food? In my experience, food, water, and shelter are the three most basic needs for humans, each of which can be met with the money supplied by a job. Increasing the ability of a person to become dependent on the resources of others, be it through food banks or welfare programs or subsidies of any kind, have almost never proven to discourage dependency. “Above all, we must confront, challenge and question the popular and pernicious idea that people living in poverty are the architects of their own misfortune.” This nails it. Thank you for brilliantly addressing a global issue that too many choose to ignore. Thanks for posting. It’s good to know what it’s like on the other side of the tracks. Very thought provoking… keep it up! Great blog! Really great profile you have here! Thank you for this informative article. Although I live in the US I think there are many parallels. The “new conversation about poverty,” from my perspective, is more than 60 years overdue. I was the oldest of eight children when my father committed suicide in 1955. My mother had only an eighth grade education, not uncommon for women at the time. My father left no life insurance or any other financial legacy for his family and we were forced to live on the public dole. People do not intentionally structure a life of poverty for themselves. It simply happens in the struggle to survive from paycheck to paycheck in the work-a-day world of low to middle income families everywhere. Men work in laboring careers until just before they’re vested in a retirement program when their jobs are eliminated due to technology or they’re laid-off in a massive cost cutting program. They are middle aged; their skills are no longer needed. Supporting a family and a home left no time to prepare for a new career. Men and women in those situations have not been the architects of their own misfortune. They took a risk that their careers would support them into retirement. How then can a reasonable person plan a secure future? With the rapid rise of computer technology things are only going to get worse. From skilled professions to the most humble sorts of labor, jobs are being lost. In medicine, an anesthesiologist in Baltimore lost his job to a robot. Most manufacturing jobs in industrialized countries have largely been lost to robots. Within the next few years we will have driverless automobiles. Think of all the traffic cops who will be out of a job; taxi drivers; deliverymen; truck drivers. The face of transportation will change dramatically and the effect on people’s lives will become even more dramatic. How can a “reasonable person” plan a life around a career that will likely be obsolete before he or she can retire with benefits? A main point of contention in the recent U.S. election revolved around how each candidate would bring more jobs to the country. There was not one word said about how we should be planning for a jobless society in which robots will do the work, repair themselves, design and build better more efficient versions of themselves? I worked my way through high school and college, a process that’s no longer tenable. Further, what’s the point of in incurring a $200.000+ debt in a state university education when the career the student had prepared for will become obsolete before the debt can be paid off? People are not necessarily the “architects of their own misfortune” and this sentiment has been a dire and delusional fallacy I’ve faced since I was ten years old. The “new conversation” is way overdue. I really appreciate your comment. I appreciate that you shared what your situation was, and I am grateful to see that some people out there can see the reality of what our society is, and what it’s becoming (or has become). And how unrealistic it is to expect ‘the way it used to be’ to work now. What a refreshing comment – and with the awareness that what you were able to do is not feasible now for us trying to do the same. A new thing i have learned that there is a thing exist named foodbank and its working.thanks for this!! Finally, I get this one. I have a plan for making this one. I will! A moving article that engenders much thought and a motive to act. Touching. I am not sure there’s a real chance to eradicate poverty, but a couple of things should be done. 1 would be to have jobs for everyone. See the woman diagnosed with depression, anxiety, and arthritis, she wouldn’t fit any job, but she would fit some e.g. Cleaner in hotel? 2. People are known to be lazy, historically, they don’t work more than they must to live, therefore these foidbanks are awesome but what if instead of just giving the packs away the system will require one day of community work for the box 3day- food or such. 3. If one can get community work then he/she can then start to be paid and so food banks are just a start. I don’t have the big picture in this but what I see around is a couple of children spoiled without limits by poor parents and I think this is a really bad influencing on poverty factor, namely, how do you raise the children. Why do you spoil them when you cannot afford? It’s a matter of labeling people because the kid is labeled at school and so on, it’s all a societal misconduct and wrongfully taught children by not only parents, but all other means as well. The U.K. poverty line is below £13,920 per year or 60% of the median pay. People find that hard to believe but we have very high standards in western countries. Briefly world poverty has improved since 1980 when almost half the world lived on less than 1.25 dollars a day ; it’s now about one fifth. In Britain it is due to excessively low pay and that is caused by the bargaining power of employers who pass the buck to the state. The poor are not the architects of their own poverty. The Guardian recommends we stop using poverty and start to use the word inequality. To many, the world where people have to access a food bank to feed themselves is just not visible. This kind of informed reportage, and movies like I, Daniel Blake, do a great job of telling the stories of real people, unmediated by the mainstream press. Whatever your view of the welfare state and how it is managed, the truth of these stories needs to be acknowledged. It is a sad state of affairs, but as you say, foodbanks are becoming the norm in modern society. Nobody seems to be addressing the issues that lead to people needing and depending on foodbank donations in the first place. I think I understand what you mean, but to clarify, when you say “addressing,” do you mean solving the problem or simply discussing it? I’m glad I strolled through this group of posts to this one. It is very close to my heart and is also the reason I am even using WordPress. Addressing as in action. I think action is needed over and above just conversation. PP, Your response is right on target. I placed my reply above yours due to the missing reply button below. I think what some forget or do not realize is that there are programs that match funds, or simply reward customers for doing business with them. I work with such a company. In other words, after a few steps are taken to establish the relationship, a customer will then be sharing part of the bill they pay with an agency of hope. (Helping Other People Endure life.) Some of our options are locked into the middle agency being in the USA, but some are not as restrictive, because I control the parameters myself. When I got to university, I was surprised to find that most of my friends and I had been on food stamps in the past. It is very common in the US. Families will work full time but still not have enough money to feed their children. I cannot speak for how it felt for my parents to rely on free food, but as a child it was a happy moment when we went to the food bank to get our groceries. I knew I wouldn’t be hungry. It is a wonderful thing that people are willing to donate goods to those in need. I hope to be one of those helping hands when I am older and have enough money to support myself. Well said. Thankfulness matters. Especially for children, wherever they live. But for some even high school is not free. Uganda comes to mind. So the cycle of poverty continues unabated. We should be even more thankful than we are perhaps. Wow. So good and timely. I agree completely and I wrote a blog talking about charity and things you mentioned and how they don’t really address social issues. It would seem that two great countries, the USA and Great Britain, share more than a common language. In my Sept. 1st blog entry, “The Great Food Divide”, I detailed the hunger in California’s Central Valley, the richest agricultural area in the richest state in the richest country, where many depend on the local food bank for their daily food. It is abhorrent that two great and wealthy nations as ourselves allow such hunger – and, as you said – the need for food banks to even exist. One of the saddest facts about societies that form part or all of its success on the principles of capitalism is that many who want to help are not able, while many who are able are not willing. I hope to change this incrementally in 2017 with a twist of the Robin Hood saga. The difference is in our case it won’t be robbery that gets it done. It will all be a matter of free will. Interesting post! It’s definitely important to address the issues of poverty. This an excellent piece that illustrates the compassion we should all have for those that are impoverished. You do a great job of explaining the different ways poverty is demonized and sensationalized and how it comes at a cost to those in need. Very inspiring and important! To ignore this is to do a disservice. Nicely thought-out observation and analysis of the impacts of sanctions and reforms on the poverty stricken. Very much agree that the voices of those who are experiencing struggles are not being heard and represented. And I agree a thousand times that they way we talk about issues in general needs to change. Many people are struggling in many way because their reality is being misrepresented, and therefore misunderstood and judged. I enjoyed reading your piece. This is really well written! I definitely agree that something needs to be done about the current situation of poverty. One thing that I am particularly interested in is how to utilize what many people deem as ‘waste’. I know in the U.S, Whole Foods is really big on donating the items that are past due, rather than throwing them out as many other organizations do. If we can get more stores to donate rather that dump, I think we might be able to better feed those who are hungry. Well said. “If it doesn’t bring in $$, then it doesn’t leave the store via the front door.” is the motto. Then the garbage dump dogs feast while people struggle, including the homeless, some of whom served as veterans. That’s another topic though. But maybe not. This is Rick from GA. Thanks for sharing. Sadly I believe the horse has bolted and the state is already abdicating responsibility to the poor….not only are welfare benefits being cut and increasingly difficult to apply for… but those wonderful figures about healthy numbers in employment are skewed…not taking into account many jobs being temporary part time or zero hours contracts…yes we have phrases like ‘ working poor’ and Thersa Mays latest ‘Just about managing’ families or ‘Jam’s too…I find it intrtesting that the Care Act 2012 dressed up in rhetoric of enablement’ absolves government of responsibility for providing health and social care….legal aid is virtually non existent now also making it difficult for those of limited means to get representation when needed in legal cases… YES indeed the state has been rolled back to a FAR greater extent than even Thatcher was prepared to go…. there is a VAST chasmbetween the haves and have nots in the UK….its almost like there’s 2 different countries within this cluster of small islands. Thanks you for writing this piece. There’s power in truth. Sharing! I am not in a crisis and I didnt use food banks when I was I had enough state food stamps and now I am not on that even though It’s touchy currently but as I progress and push myself and gain commitments to use my gifts And work back to the arts I will be fine, my hunger became my fuel! I think the more I learn about what others really need rhe mire I will be motivated to help solve that issue which is the real need, then the need for Food and nourishment replenishment will take care of itself! Last year, 2015, the people of the United States, “land of the free and home of the brave,” VOLUNTARILY SURRENDERED $3,248,723,000,000 to the I.R.S.! To put it in terms we can visualize, if it were possible to place one trillion one dollar bills on top of one another, it would rise to a resounding 67,866 miles into space! That’s a million million dollars, a thousand billion dollars, and we surrendered three and a quarter times that amount! Be proud, America! Question: were we a nation of men and women with SPINES and BACKBONES and we told the IRS to shove their CRIMINAL laws where the sun don’t shine and KEPT OUR MONEY, do you really believe there would be a need for care packages or food banks? There are one out of every two people in the “land of the free and home of the brave” who live in poverty, living from paycheck to paycheck. There are approximately 4 million CHILDREN, WOMEN and men without a place to live or food to eat here in America. There are three and a half billion people, half the population of the world, without running water, food, housing or sewage. Yet, there are just THIRTEEN FAMILIES in the world whose wealth well exceeds that of HALF THE WORLD’S WEALTH! The Rothschild family have over 500 trillion dollars in gold bullion, not paper currency. The Rockefeller family has over 13 trillion dollars in combined wealth. There is no way these “people” can achieve the kinds of wealth they possess on their own merits. They’ve stolen their wealth off the backs of billions of unsuspecting people through the powers of evil and corrupt governments. Problems will never be fully resolved and disappear. We are all human beings. However, much would be lifted from our shoulders if we did two things: 1) turned back to the Lord Jesus Christ; 2) we unanimously recognized that no one can possibly be free so long as we ALLOW a very small segment of society to govern us. Government and freedom are an oxymoron, a contradiction in terms. They’re like mixing oil and water. As Mr. Spock, on Star Trek, has been heard to occasionally say, that just don’t compute! I don’t mind paying my taxes…and don’t think of the IRS as criminal (Illegally creating economic bubbles, that’s criminal). I don’t mind supporting public roads, first responders, public education or public health care. I DO MIND that corporations such as Exxon don’t pay their share of taxes, I DO MIND that half my tax dollars are spent on a military machine that has little accountability (the Pentagon can’t figure out where almost a billion dollars went) and I DO MIND that many of our legislators sign an unconstitutional agreement not to raise taxes, yet take us to war. As for the jesus thing, we are a democracy, not a theocracy. Believe what you want between the four walls of your home and head, public spaces and interaction should be neutral and kind. My family has survived with the help of food banks for some 4 years and they were the most depressing years of my life. We’re a family of 5, and we got food enough for everyone, but I could see the shame on my parents eyes whenever they opened a completely white, except for the big red letters saying NOT FOR SALE, bag of rice. It did help, yes, but no human should live like that like it’s normal. There are two issues I find compelling about your article. One is that social structural inequality is an endogenous process built into all societies, and capitalism makes the most of it given its global hegemony. The other observation is that some of the people standing in line need to get a job, or do something other than blame others for their misfortune. I have been in those lines, and I assure you that some get government checks and act like they need more help when what they want is something for nothing. Social work is a two way street. yes! it’s a hard fact that you have explained in well-organized manner. Governments must have to take a sincere step towards to eliminate this factor. Thanks for writing on this sensitive issue. I enjoyed reading your post. I am a member of the Homeless Ministry at my church and have heard stories similar to those you mention. Homeless individuals are not there by choice and there is usually another factor at work; such as, mental illness, alcohol & drug use, aged out of foster care, etc… Thanks for your compassion in caring for those that are less fortunate. We all do what little we can. As an American, I see the poor and homeless get blamed often for their plight. It’s easier to blame and judge the person in front of you than to understand that the far removed oligarchy are the real welfare queens (Exxon pays no federal taxes, for example. Our new president is costing us millions thanks to a wife that won’t move to the white house. The Iraqi war has made a few US citizens very wealthy.) This is financialization though…increasing disparity, the plutocracy calling the shots, and the poor getting the blame and the short shrift. The only way to balance this out is progressive legislation and regulation (that “R” word is a hot button in this nation: corporations feel that regulations strangle them, when in reality de-regulation or a ‘free market’ as they like to call it, means having the ability to manipulate interest rates, create volatile economic bubbles, and manipulate foreign currency – all for their financial gain). Thanks for the informative writ! I completely agree with this post. I am a support worker, I work with vulnerable clients living in temporary accommodation. I see this situation time and time again and have had to refer clients to the local food banks. The Trussel foodbanks are brilliant as are the staff and volunteers. It is utterly disgusting that we need foodbanks, that the government are abdicating their responsibilities. What would happen if all foodbanks closed their doors and we all marched to Downing Street to demand change I wonder?! What I find more dispicable is that we still have rough sleepers in this day and age. At least my clients have some sort of accommodation but the poor folk you see sleeping in door ways breaks my heart. A lot of people will say well it’s their own fault, they’re in that situation due to drink or drugs, without knowing the full story. Homelessness can happen to anyone. Also they’re still human at the end if the day and deserve kindness and respect. Sorry I digress!! It makes me absolutely fuming though that so much money will be spent decorating Buckingham palace, with its 127 rooms when people are literally sleeping on the streets and relying on foodbanks and other charities to survive. There is a wonderful mission up here in Glasgow that has matresses on the floor for folk to sleep on during winter. Again this is great but not their responsibility! I say let’s peacefully rebel!!!!! I sincerely appreciate every point, several of which I would highlight, but that would seem redundant. I am concerned about the Brexit event may make the situation worse, perhaps. However, I am also filled with hope that some tools we have access to here in the USA could help our strong ally and close friends “across the pond.” Do try to connect those from Great Britain doing business here in the States with me so we can discuss the details. We also do not approach our mission of hope from a position of wealth, except perhaps an abundance of good will. The vicious cycle of poverty will continue as long as humanity creates selfish interest groups that collectively plunder their fellow humans thru organized gangs that pass off as Governments, Politicians,Law Enforcement, Security Agencies, Multinational corporations, Big Pharma, Banking, News Media, etc……all such artificially created structures and institutions (artificial ecosystems) are but stumbling blocks in the path of the less fortunate ordinary humans who have overcome this uneven playing field and its hurdles to reach at least somewhere in the middle and at least within sight of the ones who have set up the system and who are handing it over to their progeny for perpetual enslavement of their human stock from time immemorial. The concept of money itself was created by the first scoundrel who convinced the first idiot. Now money is made out of thin air and we are paying interest on it. The poor are but victims of this skewed set up as we know it. They have limited means to challenge the status quo of the powerful who make merry without guilt while the poor suffer The only philosophical solace here is that death will be the final equalizer for all mortals and all paths of glory lead but to the grave. A new spiritual awakening of mankind seems to underway with established traditional media companies / institutions / companies / individuals being exposed on social media. As individuals share their experiences and thoughts, all the artificial webs of deceit that surrounds them may eventually collapse as the stake-holders go in hiding from a multitude of starving angry zombie-like mobs that will eventually go wild. It may assume apocalyptic proportions in the new world order as the good battles evil.(#armageddon). The meek may eventually inherit the earth thanks to their sheer numbers. Might does not make right but it certainly makes history. Poverty is not just a disease but a time-bomb waiting to explode unless the rich do something about it. ignoring it and letting it fester is MAD . (Mutually assured destruction). We are already witnessing the growing the refugee crisis across the globe while the mob / gangs /military industrial complex operate with impunity to grow richer, but they ignore the poor at their own peril. So many people are willing to write off economic troubles as character flaws, instead of seeing how the institutions of society & individual people intersect. By labeling all those in poverty as just trying to get something for nothing, as being only lazy & greedy, conservatives & the-more-well-off can ignore those folks altogether, & absolve themselves of any connection to them. Here in the U.S., conservatives still buy into that whole bogus trickle-down idea, even though all evidence suggests it. does. not. work. And they actively hinder all government efforts at helping people ….. all while claiming their devotion to Christianity, of course! With the election of Trump, & the billionaires he’s installing in government departments, it will only get much worse. Thank you for your well-written, nuanced article here. It’s an awesome post designed for all the web users; they will get benefit from it I am sure. First, hunger is about distribution not availability or prosperity. Second, if the prosperous truly cared, hunger wouldn’t exist. Third, government is merely a subjective barricade between the prosperity/scarcity dynamic of social evolution. How do we create a mutually beneficial conversation between the varying facets of the social construct described above? Thank for this informative article. This very real struggle is faced by so many globally.